Helping his friends is at the top of Kevin's to-do list. Kevin likes to start his day right. That means a nice big filling breakfast. He is even known for occasionally cooking himself a full English breakfast on Sundays. Luckily, today he has a little time, so he puts on a Beyoncé playlist on spotify and starts to fry up his eggs and bacon! He couldn’t have asked for a better start to his day. The rest of his morning is filled with work. After his business studies BTEC course, Kevin is thinking about starting a new business in Brighton. Maybe a florist shop? Although he is seriously considering a flower shop, he is still open to the possibilities. He is currently doing research on his options and where would be a good location for his brand-new business. He might ask his best friend Bruce - the magpie he met at the BTEC course - to be his business partner. Around lunch time, he gets a call from his good friend Howard. Howard is currently wandering around the Lanes looking for inspiration for a new look. Kevin figures he can kill three birds with one stone: get lunch, help Howard and take a look at what kind of competition he would get in the Lanes! They meet up at the cute french restaurant close to the shops. Kevin is the type that doesn’t eat out much, but if he does, he will go somewhere that is really worth it. No fast-food for Kevin! After a delicious meal and the best tarte tatin in Brighton, they head to the vintage shops: Beyond Retro, To be worn again, Dirty Harry’s… Howard wants to make a bold statement with his new clothes. He wants something totally different from what he has in his closet right now. He ends up choosing a leopard print catsuit. Kevin thinks it suits him! Crisis averted, Howard needs to get back to work on his paintings. But Kevin doesn’t feel like going home quite yet. As it’s late afternoon, he heads to Brighton Pier. He loves to watch the starlings dancing in the sky. While he waited for the show to start at sunset, he couldn’t help himself: he just had to take advantage of everything the pier has to offer. So he gets his fortune read (apparently he will get rich soon and love is just around the corner!) and gets himself a lovely candy floss at the end of the pier. While he is lazily strolling around with his candy floss, he spots the arcade… and falls in love with a cuddly toy. Let’s just say he probably spent more money than the toy was worth. But all was forgotten when the starlings started rhythmically flying over him. Kevin couldn’t stop staring at the glorious dance. 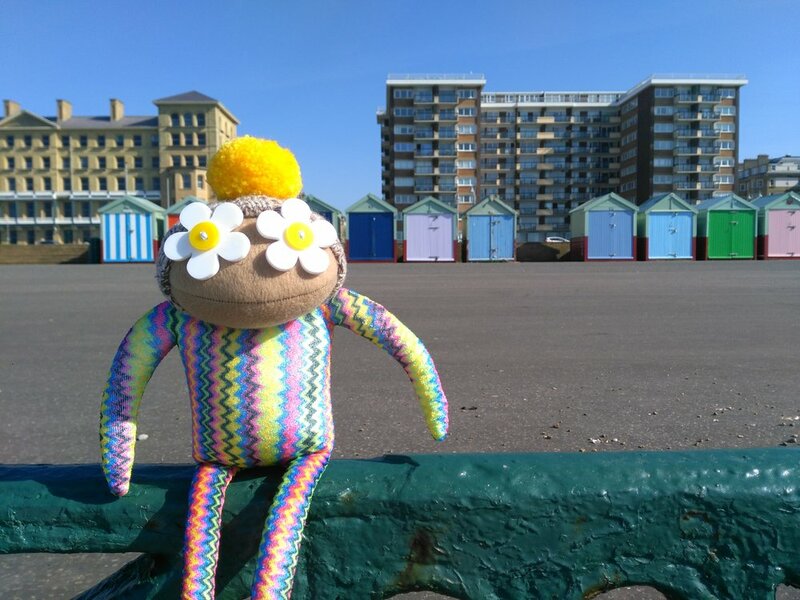 He lived his whole life in Brighton, so he has lost track how many times he has witnessed the wonderful spectacle. But it didn’t matter. It always felt like magic to him.